Please find below our notes on compatibility for OWL Intuition -PV and battery storage systems. The diagrams provided are by Wind and Sun (http://www.windandsun.co.uk) and are typical depictions of how each type of system is wired in. Due to the nature of CT-based monitoring systems such as the OWL range of products, DC-Coupled Energy Storage is not compatible with OWL Intuition -PV. This is because when you draw electricity from the battery, this electricity flows out through your generation meter as if you were generating electricity at that time - our system then picks this up as "generation" even at night and so provides a false generation reading for your panels. Whilst this, technically speaking, is still generated electricity from the solar panels either way and is depicted as such by our systems, it can prove confusing to end users and so we consider this type of Battery Storage solution incompatible with our systems. While the battery is charging the "output" of the panels seen by our system is also lower, as less electricity is being directed out through the generation meter - where some is diverted to the battery. AC-Coupled Battery Storage is considered fully compatible with our products. 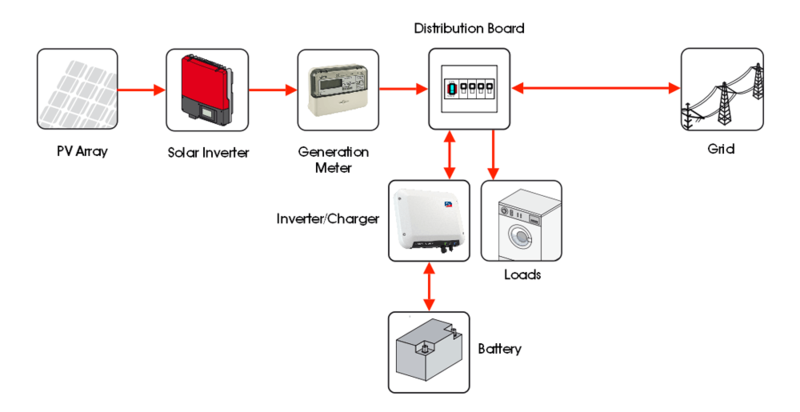 This is because generated electricity is detected as it flows from the generation meter to your distribution board (or grid, in the case of export) and anything that gets sent to the battery is effectively detected as "usage" by the system. Any electricity then used from the battery is not detected again; so we don't get any duplication of usage readings, and we've correctly identified the amount of electricity used in the property. All of our readings for generation, usage, import and export therefore tally up as we see the full and current generation from the solar panels live, and detect electricity that will be used from the battery simply before it gets used. Any usage above and beyond the charging and usage of the battery is still detected by our systems as standard usage. What information does the Solar Financials provide?